When it comes to aviation, you can’t just rely on your TV weatherman, or your favourite weather website. You need to learn how to read aviation weather (METAR) and forecasts (TAF) in order to get a deep understanding of what the current weather is, and what’s coming your way. Seeing a METAR or TAF for the first time can be intimidating, but we’ll show you how to read that weather like a pro! 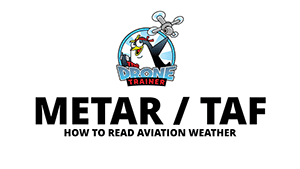 In the above video we go over a sample METAR and TAF from a local weather station. You’ll get an understanding of what each part of the METAR and TAF stand for, as I go through a real life weather example. There are many different weather events that can appear in a METAR or TAF, so I’ve also created an aviation weather cheatsheet for you to download for free. This cheatsheet has all of the cloud cover descriptions, as well as the acronyms for all of the common weather events that you’re going to see in your local weather forecasts. If you have a weather related question, or want to ask us another drone question to be answered in video format, just get a hold of us on the contact form and we’ll get back to you right away with an answer! We look forward to hearing from you!